In the grand road trip to Southern India, there were many deviations. Most of these were unplanned and led to some stunning destinations. Among these was the journey to the Veerbhadra temple in Lepakshi in Anantpur, Andhra Pradesh. A 16th century architectural marvel, built in stone with fables at every nook and corner in the temple complex. I had been to Belur and was astounded with the Hoysala architecture there. But now the wonders of Lepakshi were ready to awe me. It was nearing sunset and we were on the road since morning. After leaving Tirupati and heading onwards to Horsley hills, the plan was to return to Bangalore by night. Just then I saw Lepakshi on the map. A quick search and after a few enquiries at the AP Tourism hotel at Horsley hills, we were good to go. Lepakshi is easily accessible from Bangalore, but we reached it from Hindupur. An off beat route rewards in it’s own way and this one was no exception. Scores of gigantic hills ,holding stacks of huge boulders as if practising balancing them gave us company throughout. Overcast skies added to this diversional drama and by the time we reached it had already poured in Lepakshi. The temple is built on a rocky hill Kurmasailam which resembles the shape of a tortoise. The main temple (inner sanctum) closes at 6 pm and it was 5.55 pm when we reached: a very close shave. There was hardly anyone else in the compound. It was after 6 pm that my lone explorations of this temple begun. The shrine was built in the Vijayanagara era by two brothers : Virupanna and Veeranna who served in the Vijayanagar kingdom. When you enter the temple, you can see two maroon marks on one of the walls. The story behind these marks is terrifying. Legend says these are the marks of the tears of Virupanna, the treasurer in the kingdom. He was accused of withdrawing money from the royal treasury without the king’s permission and this infuriated the king who ordered the blinding of Virupanna.Before the king’s men could do it, the disheartened Virupanna gorged out his own eyes and the marks on the walls are of his bleeding eyes. 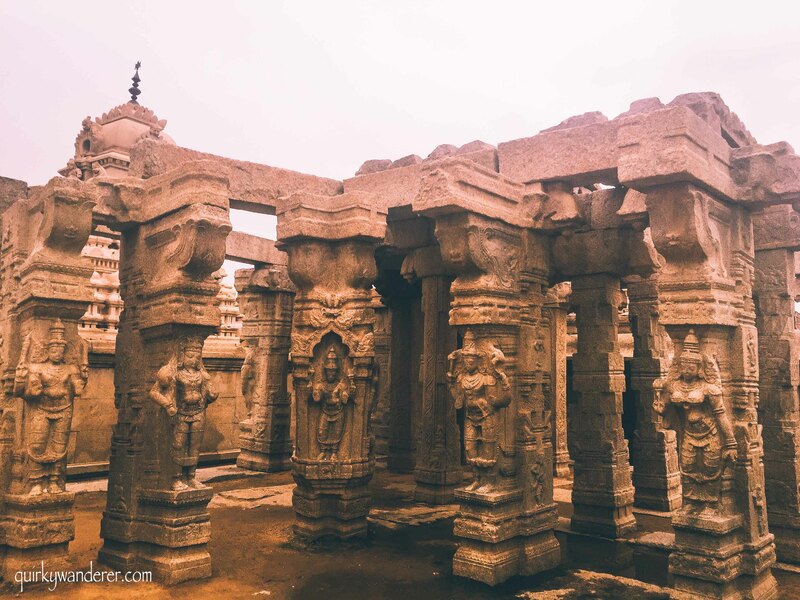 Architecture: Being an architecture lover and having a penchant to click temple architecture, I fell in love with the Vijayanagara style of architecture of the temple. The main temple has three sections: The assembly hall, the Area Mandapam and the Garbagriha or the main sanctum which hosts the statue of Lord Veerbhadra (fearsome form of Lord Shiva). From the time I stepped inside, I saw only sculptures: Carvings of Gods and Goddesses, of dancing nymphs, of animals, of soldiers, of mythological creatures , of saints, of musicians. There wasn’t any part of the temple that wasn’t covered with art. The columns and pillars were carved too, depicting the various forms of Shiva, as if each one narrated a story. But one of these pillars was special. The temple at Lepakshi has a pillar that doesn’t rest on the ground fully. I could see a tourist trying to insert a piece of cloth underneath and it coming out from the other end miraculously. Indeed an architectural and engineering marvel, this famed pillar is said to be hanging without any support. There are nearly 70 pillars in the temple complex, but this one takes all the fame. The reason the hanging pillar is a little dislocated is because it is believed a British engineer, tried to move the pillar out of his curiosity to know the secret behind it. While I couldn’t get enough of the architecture of this temple, the art on the ceilings was a complete surprise. It was as if the architects of the temple wanted to woo you from every possible direction. There are scenes from the Puranas, Mahabharata and Ramayana in these murals. One of the frescos has the 14 forms of Lord Shiva and is considered to be the largest in India, measuring 23 x13 feet. An earnest request to the AP tourism board and the ASI to please look into the restoration of these frescos. Some of them were peeling and require immediate attention. The priest pointed out that it was here that Shiva and Parvati got married. This explained the presence of the incomplete yet beautiful Kalyan Mandapam in the temple complex. As I walked around the Mandapam, it felt another world. Roofless pillars stood tall as if guarding the complex. The flooring was uneven and there were water pools formed in the depression areas. The complex was flanked by symmetrical corridors in each side and on the eastern side there was a huge boulder of granite stone which has carving of a serpent over a Shivlingam. This was perhaps the most mystic corner of the entire temple complex. The temple complex was completely deserted. I walked through the outer corridors and called out just to hear my words being hurled back at me in echoes. It was just the temple and me and all these inanimate figures smiling back at me. Yet, I felt as if someone was watching. An eerie feeling but not discomforting. Was it the presence of Shiva? Or was it because I was completely alone in the company of empty stone corridors and sculptures? As I exit, the carved dancing lady with a serene facial expression looks at me, with a suppressed smile like she knows it all. The temple is functional and closes at 6 pm. However you can explore the complex once the main temple closes. Do not miss the huge Nandi when you enter Anantpur. Located near the main temple complex, this massive Nandi statue is one of the largest monolith Nandi statues in the world. The architecture sure deserves to be in awe of, especially the immaculate symmetry! I liked the largest carving of Shiva and of the serpent. Maybe the color of the rocks and damp conditions makes it look spooky…these rocks might as well shine bright and look crisp when the sun is out. Grandeur of stone temples from Karnataka and Tamil Nadu is amazing. Most of stone temples here in rajasthan were built in pre 14-15th century period. Their architecture is quite different from the ones in later period when Mughal influence started showing. These temples at Lepakshi depict the greatness achieved with stone carvings. I love the old picture effect in your pictures, a departure from your usual pictures. Do you think temples like these are a great place to let your imagination loose and get a huge creative inspiration? What great minds and thoughts must’ve been present here when creating this grand piece of architecture! Wonder if those sculptors and builders were aware of the beauty they were creating! Beautifully narrated with grand pictures !! Love this temple and the carvings. OMG !! This is so amazing. I love the corridors , they look so authentic indian architecural beauty. Love exploring offbeats. After Hampi, i think this is going to be next stop for me. Do you know how far this is from Hampi? This temple looks awesome and would love to check it out. But on the photos, was there any other visitors looking around? Fascinating post! I have never been to India, but I am adding this to my list of things I have to visit in the south. I can’t imagine the amount of time it took to create all of the pillars and beautiful wall carvings. Nice detailed post. Few years back, I visited Hampi and your photos from Lepakshi reminds of it. I have to visit Lepakshi. Added on the list. Thanks for sharing this post. I have heard about the hanging piller of Lepakshi, always wished to visit but till now, I coludn’t. After reading this, am very much interested to explore this place very soon. Thanks for sharing. Loved the story behind LePakshi. The sculptures makes it hard to believe its so close to Bangalore. Loved the pictures and details. Cheers! 165 km from Bangalore, about how long does that take? Lepakshi looks like an amazing temple complex to explore. I would love to visit someday. Wow, there are so many little known places (at least to me) that are worth visiting. Learned a new word today, frescoes. A fantastic post, literally. As you say, the temple looks as if it’s from another world. When I was traveling around China, often I wished I could know the stories behind the temples. It’s great to come across a post like this that explains everything. Keep up the good work. India is by far our best country to visit and this is one of the reasons why. The exploring is just endless and the history so spiritual. Temples blow my mind! hampi was an amazing place for us for the same reason. Loved this post, cool work!